Getting the kids to school on time everyday day this week. Quite a feat some days and I’m happy to report that both kids have settled into school really well. Shopping!! Anytime I can pick up a bargain makes for a great week. I’m one of the many singing the praises of K-mart ( again ) . How good are the home wares at the moment. 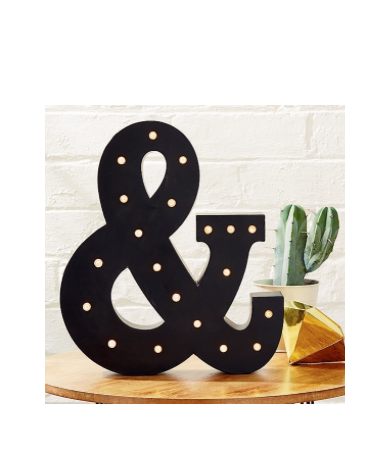 Just when I thought there would be tears and tantrums I FINALLY got my hands on one of the Ampersand Lights…. who knew the ‘&’ actually had a name! Now I just need to convince hubby that yes we do in fact need stools and a coffee table and possibly a new lamp! 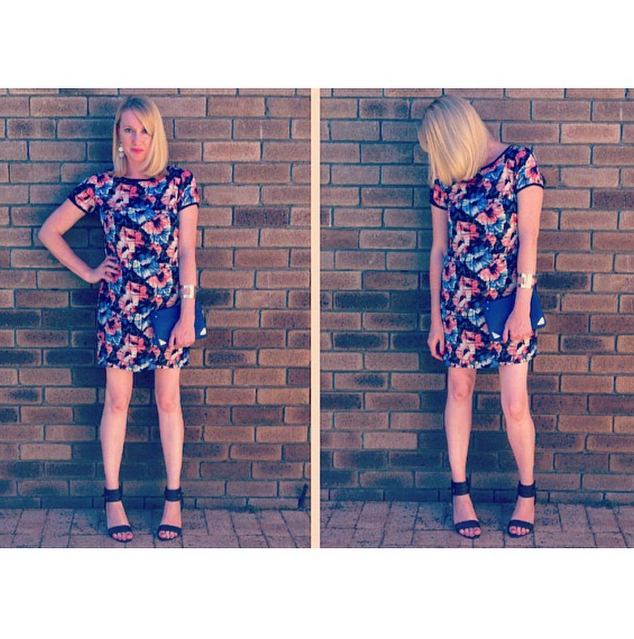 And don’t worry, it wasn’t all home decor I also found a really pretty shift dress! Current stock and only $15. If your on IG check the hashtag #kmartstyling for more inspo! Now perhaps one of the more funny/ lovely things to happen this week was being recognized in K-mart by a gorgeous Instagram follower named Bree! She was so friendly and for the rest of the day I was feeling pretty good about myself! And now Social Media. Ahhhhh Social Media. I have seen many posts over the last two weeks that have talked about negative comments. I have been very fortunate thus far with blogging and Social Media to have not received any harsh feedback. I just don’t understand why people feel the need to tear down others. If you don’t like something you see then just scroll on by, unfollow…. anything! I’m from the school of thought that if people are going to criticize you for putting yourself and your ideas out there, then that says more about them than it does about you and what you’re doing. If you’re someone like me who likes to talk / blog about fashion then it goes without saying that not everyone will like your outfit choices. And that’s okay. I don’t love every outfit I see either but I would never say something hurtful or nasty to the person posting it. If you wouldn’t criticize someone to their face then for the love of chocolate don’t be a keyboard warrior. I love the community of bloggers, Instagram & Facebook followers that I have. I’ve had quite a few people tag me in photo’s because they’ve taken inspiration from an outfit I’ve worn. This brings me so much joy, I can’t even begin to explain how this makes me feel! I’m just me, a mum from the burbs, raising kids and shopping on a budget. I post outfit photo’s with the #everydaystyle hashtag with the super stylish Nikki from Styling You ( who I’ve been lucky enough to meet in person! ) and follow along with many other women doing the same because it’s fun and inspiring. I try not to get caught up in the politics of Social Media, it’s too exhausting! Do what you love, be kind to one another. If you have nothing nice to say then say nothing at all. Seriously just ZIP IT!! Keep it friendly, compliment someone…… they may really need to hear it. I’m off now, sorry for the rambling post but I did warn ya!! Previous If We Took a Holiday! Next Theo & Co Pizzeria! Totally agree. I see no reason why people have to tear down others (mostly due to their own jealousy or insecurities). Why shouldn’t we be able to celebrate looking and feeling good, joy in our families or satisfaction with where we live or what we’re doing? I’m really thrilled with the amount of likes and positive comments I’ve had since I’ve started blogging and my associated Instagram account and I try and do the same to others. Oh Malinda, I am so chuffed to know that I left you feeling good just by saying ‘Hello’. I honestly love your #everydaystyle and often look to your IG account for morning outfit inspiration. Seriously! I agree with you about the negative people. I subscribe to the school of thought that if you wouldn’t say it to someone’s face, what makes it OK to say on social media. PLUS if you don’t like what someone is posting/wearing/saying/sharing then don’t follow them on social media. People have far too much time on their hands. Speaking of which, I must be off. I am looking after an extra Mr 4 today and he and my Mr 4 are keeping me busy. Have a super day and an even better weekend. Awww Bree you are such a lovely person! I’m always chuffed when someone takes the time to say hi or comments on anything I do. It really means a lot! Great post. Completely agree. I’m rather over the high school antics of some people in social media town. I’ve been really enjoying my social media free weekends. Have a great weekend. Looking forward to catching up soon. Love your rambling!! And that Ampersand light!!! Amazeballs!! Hope you’ve had a good week, I’m looking forward to hearing more about that amazing trip to Japan! Yes I’m sure the social media free weekends are great, especially for someone like you who I’m sure sees and hears a lot more than I do! Like I said I’ve not had any issues but I really feel for other people who have had to put up with this terrible behaviour. Anytime you want to catch up I’m there! Not sure why your comment ended up down here Raych!! That Ampersand light was such a pain to get hold of. I went to so many stores, honestly it like I was possessed! Lucky for me a lovely K-mart worker put my name down for one and rang me when they finally came in, you could always try that! Good rambling! Glad you found the Ampersand Light. Haven’t been to Kmart for a while – might take the kids there next week when it’s MELTING degrees and we need some air conditioning. And I agree – go find something on the internet you do agree with instead of bagging those you don’t for the sake of it. Ahhh yes melting degrees! My favourite escape is to the shops…… I think hubby probably wishes I’d find somewhere else to go! And yep far to many haters on the internet, there’s just no need for it! i see things everyday that isn’t my taste, annoys, irritates or properly pisses me off…. i just roll on. i do not take the energy to comment. And that’s exactly how it should be Tracie! Or perhaps if you don’t like what a person is posting you could just unfollow!! PS I think you’re awesome! I’m with you! If you don’t like what you see or don’t agree – unfollow, scroll past, don’t read. Don’t use it as an opportunity to tear someone down or be nasty or unkind. 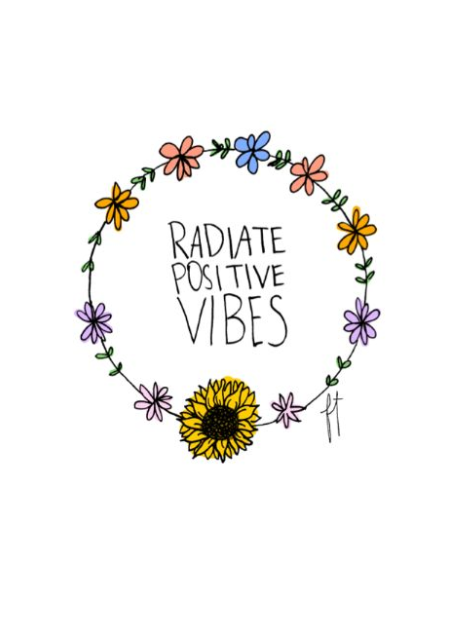 The world has enough negative energy going around, let’s sprinkle positivity glitter as far as the eye can see!